Do you find yourself struggling to play guitar parts even though you know exactly where to place your fretting fingers? If yes, you are not alone. It is a common problem. Playing certain passages can be a real struggle. And when you struggle, you lose confidence. We have all been in that place where we dread an upcoming guitar part in a piece of music because we do not know whether or not the notes will come out right. Has your gut ever filled with fear in those situations? It happens! A lot of guitarists miss strings when they play, and fail to play fast enough to keep up with the music. I would not be surprised if your hands frequently tire out and get stiff too. When something is difficult, you tend to overwork trying to get it right. Then, your playing worsens. It is a vicious cycle. If you are struggling to play guitar parts and failing to progress, the problem may be something you have not thought enough about: Your picking technique. I am talking about how you use a standard guitar pick (a.k.a. flatpick or plectrum). Think about it: Half of guitar playing is picking. Yet the majority of guitar instruction pays little attention to this important technique. Instead, most of the focus is on the fretting-hand fingers. Apparently, if you know where to place your fingers, everything else is supposed to fall into place. But in many cases it does not. That is when your playing suffers. In fact, so little attention is given to the picking hand that you may have not even considered it to be the root of your problems. 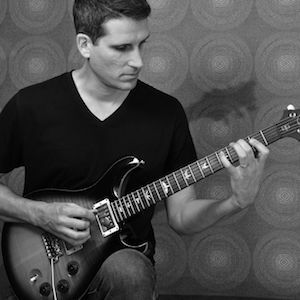 Generally speaking, guitarists do not have trouble with their picking technique when playing slow passages. In these situations, a special picking technique or strategy is not often necessary. Technical problems seem to sneak in when faster picking is needed. By faster, I do not mean blazing fast or “shredding” necessarily. Many common guitar riffs and solos found in popular styles of music are played at only moderate rates. But even then, you may find that the music can trip up your accuracy, especially if you have not planned out your picking. The reality is, there is a lot more to picking than just down and up. There are many things to take into consideration. These things can mean the difference between playing a passage flawlessly and falling flat on your face! If you have not given much thought to the aspects of picking listed above, you should see why you have been struggling to pick proficiently. Great guitar players do not leave their picking skills to chance. Instead, they get to know all the fine details of guitar picking, and then they take advantage of techniques that increase their accuracy and efficiency. They get rid of bad habits that slow them down, and they always have a plan in place so that they play their parts correctly each time. On top of all of this, they eliminate stress and strain and stay relaxed and comfortable while they play. Developing a solid picking technique requires you to develop a strategy on how to approach your picking in each situation. With a plan in place, you will realize you are capable of far more than you might have previously thought. You simply cannot play guitar fluidly without intentionally focusing on the development of these techniques. If you are unsure about any of them, you have work to do. You have probably seen picking techniques taught by other instructors. The problem is, these instructors play heavy metal styles of music and pick at the absolute fastest rates possible. They will lead you to think you need to be a head-banger and an advanced player to learn how to improve your technique. This is not so. Picking techniques are used in all styles of music, not just in heavy metal. This includes all the familiar acoustic and electric guitar songs you hear on classic rock radio stations. And picking techniques are not just about playing at an advanced level or playing super-fast. They are about playing better at any level and any rate of speed. This is where Guitar Picking Mechanics comes into play. Guitar Picking Mechanics equips you to play popular styles of music as proficiently as possible by training you to use the proper techniques needed to play common guitar parts. The process is not all about playing tedious drills over and over all day. Sure, there are exercises. But you will also discover techniques that will make an immediate difference in how well you pick, so you will see fast results. You also play examples composed in the style of familiar songs, so you learn the most practical skills. You even apply your newfound skills to your own improvisations and compositions so you make great music while you get better. 84 figures featuring standard notation and guitar tablature. 74 audio tracks you download online at no additional charge. If you need help at any time, email the author for free support. Q: Do I need to get both the book and the video? No. You can work in either just the book or just the video. The book and video can also be used together if you prefer to have both forms of instruction. Q: How do the book and video differ? Do they contain the same instruction? The book and video feature the very same instruction including the very same figures. The only difference is, one is presented in book form, and the other is presented in video form. Is this course part of Fretboard Theory? No. Guitar Picking Mechanics is a separate course. It’s sold separately and it’s not part of any other course. Is Guitar Picking Mechanics in your member area? No. 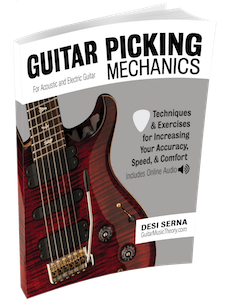 Guitar Picking Mechanics is not in the member area where you access the Fretboard Theory course files. The video version of Guitar Picking Mechanics is hosted by Gumroad. Click on the video buy button in the format options below for more details.